Rajasthan, the largest state of India was formed on 30 March 1949 with Jaipur as the state capital. From throughout the British rule Rajasthan was known as RAJPUTANA, which was denoting soil of Rajputs. Rajput families came out and detained their influence all over the Rajasthan since 700 AD. Once known as the 'Land of the Kings', the state still retains the glory and richness of those times with its marvelous monuments, colorful traditions and customs. Earlier it was a part of various states; some of them were Mauryan, Yaudhya, Kushan, Gupta, Huna, Malava and Arjunya. For a traveler who is interested in the history, culture and the lifestyle of the people of the Oriental world, Rajasthan covers most of the area of the Great Indian Desert (Thar Desert) with one edge paralleling the Sutlej - Indus river valley along with its border with Pakistan. Rajasthan is a perfect tourist destination and tourism opportunities in Rajasthan are immense. Raj Tourism offers a great variety of travel experiences. Whether it is sand dunes, wild life tours, Desert safari, forts and palaces, the colorful tribal life or the fairs and festivals of Rajasthan, travelers to Rajasthan are assured of a truly regal experience. There are best known wildlife areas in Rajasthan as Ranthambore National Park, the sariska Tiger Reserve, Keoladeo Ghana National Park and the Bharatpur Bird Sanctuary. Come, feel the royalty of Rajasthan yourself! Rajasthan is one of India's prime tourist destinations. Nobody leaves here without priceless memories, a bundle of souvenirs, and an address book full of friends. Jaipur: Jaipur city also known as pinkcity is the modern state of Rajasthan, Jaipur is a modern city built according to the specifications laid down in ancient architectural texts. Jaipur is as remarkable for its marvellous architecture and town planning as it is for the lively spirit of the people who inhabit it. The city presents a unique synthesis of culture that has to be experienced in order to be appreciated. Udaipur : Udaipur city is famous as a lake city, the Lake Palace on Jag Niwas Island in the middle of Pichola Lakes is the finest example of its architectural and cultural explosion. Udaipur was capital of the Ranas of Mewar in past, founded in the 16th century, Udaipur is known for its fairytale palaces that nestle along the banks of a lake, or completely cover islands in its midst. Udaipur is known as the Venice of the east. Jaisalmer : Jaisalmer, an important ancient trading centre because of its strategic location on the camel trade routes, is often described as the 'golden city'. The westernmost citadel of the desert, Jaisalmer has an ancient history linked with its development as a trading centre. Parts of its 'golden' fort continue to be inhabited, and its cobbled streets lead through a journey of medieval enchantment. The havelis, built by merchants of the 19th century, are exquisitely carved from golden-yellow sandstone and are still in a beautiful condition. Ajmer: Ajmer is venerated as a holy place for both Hindus and Muslims and revered pilgrimage destination for more than one community. One side of Ajmer is flanked by the beautiful Ana Sagar lake while on the other side are the barren Aravalli ranges. It has the mausoleum of the Sufi saint, Khwaja Moinuddin Chishti, whose blessings are eagerly sought by pilgrims to his dargah. On one side of Ajmer is the beautiful Ana Sagar Lake and on the other side are the barren Aravalli ranges. 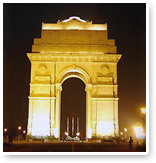 India – the land to travel to, a haven of tourism delights, a civilization to tour through. India, long considered only a "cultural" destination, is in addition the ultimate "outdoor" destination as well, with wide ranging options for adventure. ITourists come to India for its wealth of sights, cultural exuberance, diversity of terrain and in search of that special something, an extra punch that only India promises and delivers. 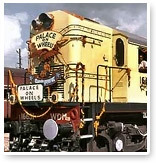 Feel like the royalty on board the Palace on Wheels - a completely self sufficient train. Fully air-conditioned, the train comprises of 14 deluxe saloons, equipped with world class amenities to enhance the pleasure of traveling.